Imagine a home where every arrival is an adventure and nature puts on a different show each day. First a trip on the Chappy ferry from Edgartown, down the road to the Dike Bridge and then over the sand out beyond the lighthouse. 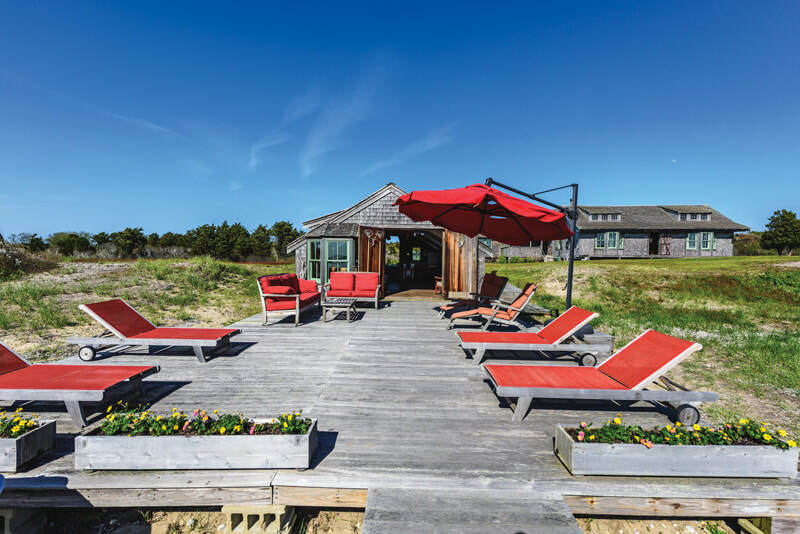 That’s life off the grid on Chappaquiddick’s Road to the Gut where this four-bedroom property on over five acres is surrounded by 500 acres of conservation land. 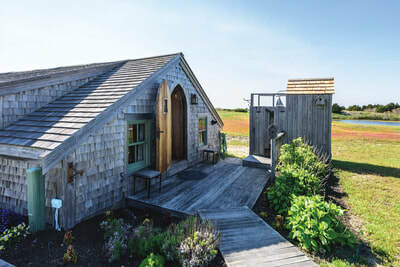 The Trustees of Reservations’ Cape Poge Wildlife Refuge encompasses seven miles of barrier beach facing the Atlantic, the historic lighthouse first built in 1801 and the calm shores of Cape Poge Bay. This home sits pondside, perfect for small boats or kayaks and the owners walk right off the deck to go clamming and scalloping. Cape Poge Bay is a favorite hangout for striped bass and there’s plenty of incentive for surfcasting from East Beach. And it’s all completely self sufficient with solar powered electricity, propane for the stove and hot water heater, two monitor heaters and a wood stove. 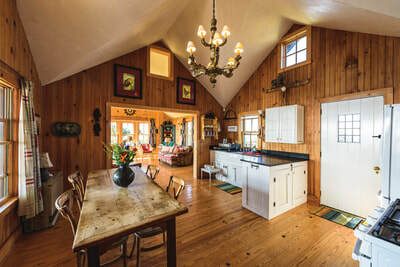 The current owners have substantially expanded and upgraded the home while maintaining the spirit of the rustic, three-season house they purchased 24 years ago the day it went on the market. 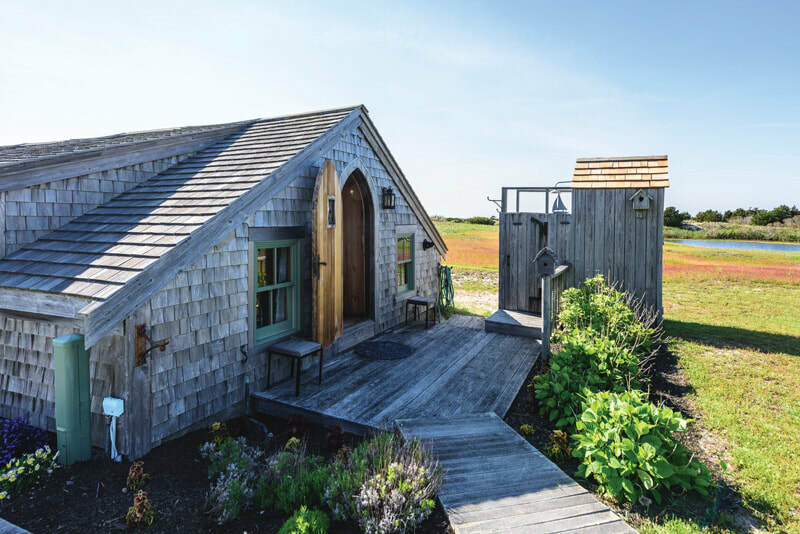 “It was an 800-square-foot duck hunting camp with cots in the living room but it was exactly what we were looking for - waterfront property with complete privacy,” he said. Pine paneling and vaulted ceilings lend a casual and airy feel to the home. 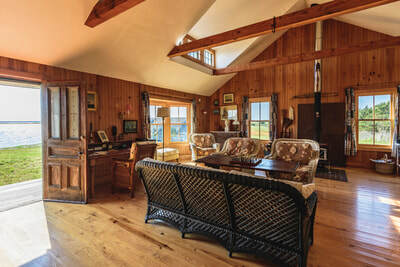 With the exception of the tower sitting room with its viewing deck, the living space is all on one floor with water views from almost every room. A large entry hall with stairs to the second floor opens to the eat-in kitchen, sunroom and walk-in pantry with laundry facilities. The oversize living room with a wood stove provides plenty of room for entertaining from spring through fall and guests can spill around the corner to the open porch. 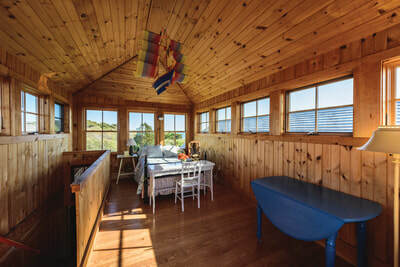 The private master bedroom has an en suite bath with a shower and an antique soaking tub. A separate hallway leads to two more bedrooms that share a bath. Two small freshwater ponds on the property attract swallows and dragonflies as well as a larger variety of birds that keep the bugs away. The constant breeze allows windows to remain open without screens. 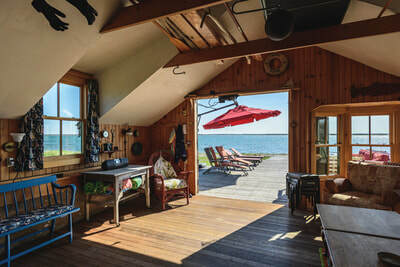 A boardwalk leads to the 1910 solid oak boathouse at water’s edge that is now a one-bedroom guest house with a living/sleeping room, full kitchen, expansive deck and potential for a bathroom. 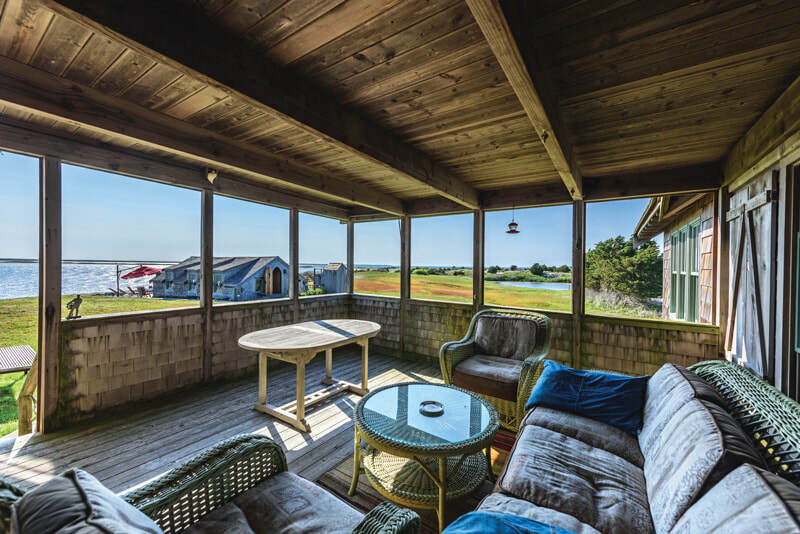 And what a view from the deck - across Cape Poge Bay to the Gut and Chappy’s North Neck, to Edgartown and on to Nantucket Sound. In July and August the sky lights up with fireworks from Edgartown, Oak Bluffs and Falmouth and spectacular sunsets are followed by beautiful cloud formation as the moon rises behind the house.